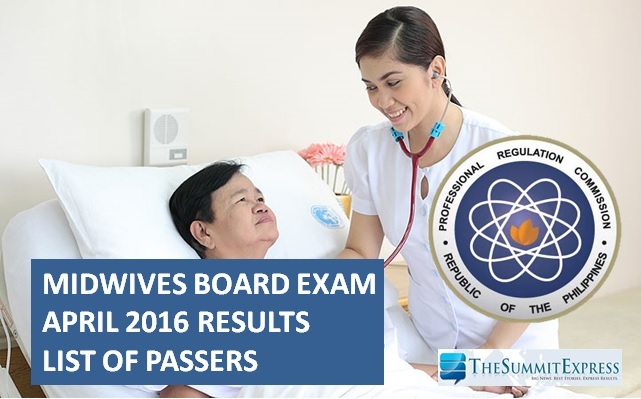 Those awaiting results of April 2016 Midwives or midwife board exam can find here the complete list of passers, top 10 (topnotchers), top performing schools and performance of schools as the Professional Regulation Commission (PRC) and the Board of Midwifery released results in 2 working days after the exam. PRC on Wednesday, April 20, announced that 1,055 out of 2,145 passed the Midwife Licensure Examination. The midwifery board exam was administered on April 17 and 18 (Sunday and Monday) in the cities of Manila, Baguio, Cagayan de Oro, Cebu, Davao, Legaspi, Tacloban, Tuguegarao and Zamboanga. The two-day exam covered the following subjects: obstetrics, fundamentals of health care, infant care and feeding (Day 1) and primary health care and professional growth and development (Day 2). According to PRC, the target release date of Midwifery board exam is on Thursday, April 21, 2016 or in 3 working days after the exam. In April 2015 exam, results were out in 3 working days. PRC named 882 out of 1,968 who have passed the Midwife Licensure Examination. In November 2015 exams, results were also released in 3 working days. 1,273 out of 2,867 successfully hurdled the test.